I hope you and your entire family are well. I was at Zen Center during January and February of 1970. 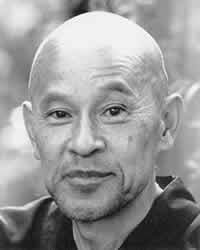 It was very meaningful for me to have lived in the community, with Suzuki Roshi, at that time, as I had just begun sitting that October ‑‑ it gave me a strong base for practice. One sunny afternoon Roshi, Okusan, Chino Sensei (I believe) and Yoshimura‑sensei were in the lobby, preparing to go to Los Altos. It was Friday and there was a very light atmosphere. Looking at their waiting car I had what I thought was a somber and unique thought‑ "That's just a regular old car and these venerable people are going to get in it and travel for miles on the freeway, completely open to risk." Then, as they were moving toward it, saying goodbye, Yvonne, at the top of the steps, called out through a grin to Roshi, "You be careful now; we don't want to lose our treasure!" He turned, halfway down the steps, and started to laugh; hands‑ SMACK!‑ and up‑"no more!" He threw his head back and roared. His laughter was infectious (as well as relieving). He seemed to have taken the fear, drawn it vividly into the open, and disposed of it by the time he reached the sidewalk. He was still tickled and laughing as they drove off. One evening Roshi was in the living room, talking and answering questions informally. He was sitting on the couch with his legs folded. I watched as he took a sip from his teacup, and then in one smooth motion, with arm and back almost as a single limb, he leaned forward and placed that cup square on that thick carpet. I really can't do it justice ‑‑ the movement was just so sure and so simple. I left after a few more minutes. Parts of two lectures also stand out. They are, roughly paraphrased: (1) "You must chew well your brown rice. Brown rice tastes not so good at first, but more you chew the better it taste. White rice taste good at first but the long you you chew, it begin to taste not so good . ."
(2) "In growing plants you must take care of the soil. Don't worry about the plants, just feed and take care of the soil and the plants will take care of themselves."